The Florida Trail has a lot of poison ivy — far more than the AT and PCT. There are many different varieties of poison ivy and Florida is home to Eastern Poison Ivy (Toxicodendron radicans ), which is both a ground vine and climbing vine. This is the same variety of poison ivy found on the Appalachian Trail. About 15% of people do not develop an allergic reaction to poison ivy but the rest of us get a painful itchy rash. This rash is caused by an oil called urushiol (you-ROO-shee-all) found on the leaves, stems, flowers, and roots. Unfortunately, urushinol remains present even after the plant has died. Plant ID isn’t always easy. The color and shape of poison ivy’s leaves varies depending upon the sub-species, local environment, and time of year. Hikers from other parts of the country may be familiar with how leaves change from reddish in spring, green in summer, and yellow, orange, or red in fall. Because of Florida’s relative warmth, the leaves are usually green, with a reddish stem. Other characteristics are more consistent across sub-species and geography. 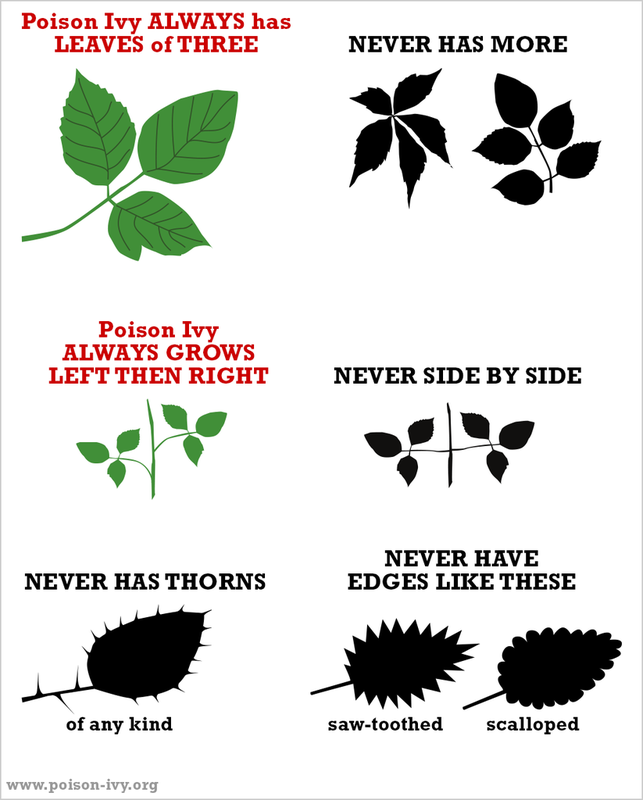 Poison ivy plants typically have leaf arrangements clustered in groups of three leaflets: “Leaves of three, let them be.” The 3-leaf clusters grow in a staggered, left-right pattern, and are never side-by-side. It never has scalloped or jagged leaves. It never has thorns. In Florida, the plant prefers wetter areas. We have never found it in dry, sandy areas like the scrub. If pines and saw palmettos dominate the landscape, there probably isn’t any poison ivy. 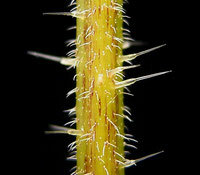 However, along creeks and in swamps, or anywhere hardwoods thrive there will be poison ivy. The climbing vine is often on tree trunks trailside in wet areas. There are a number of plant species in Florida that have evolved to look very very similar to poison ivy. One of these mimics looks so remarkably like poison ivy its virtually indistinguishable except that its leaves grown in clusters of 5 instead of 3. 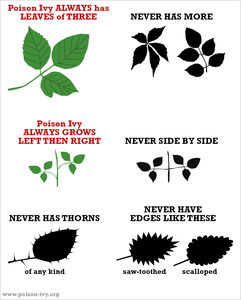 Rather than go into detail about these mimics, we want to caution you to avoid any plant that resembles poison ivy, even if your certain its harmless. The reason is that these mimics prefer the same environmental conditions as poison ivy. You often see them growing next to each other, even winding around each other. It is safe to say that if you see a mimic, the real thing is nearby. Poison ivy rash (and other poison plant rashes) cannot be spread from person to person. Once on your body, urushiol oil is absorbed into the skin and cannot be spread by scratching or touching the rash. It can seem like the rash is spreading however. In those cases, the rash is simply not appearing all at once because the plant oil was absorbed at different rates on different parts of the body or because there were multiple exposures to urushiol at different times, possibly from contaminated objects or oil trapped under the fingernails. 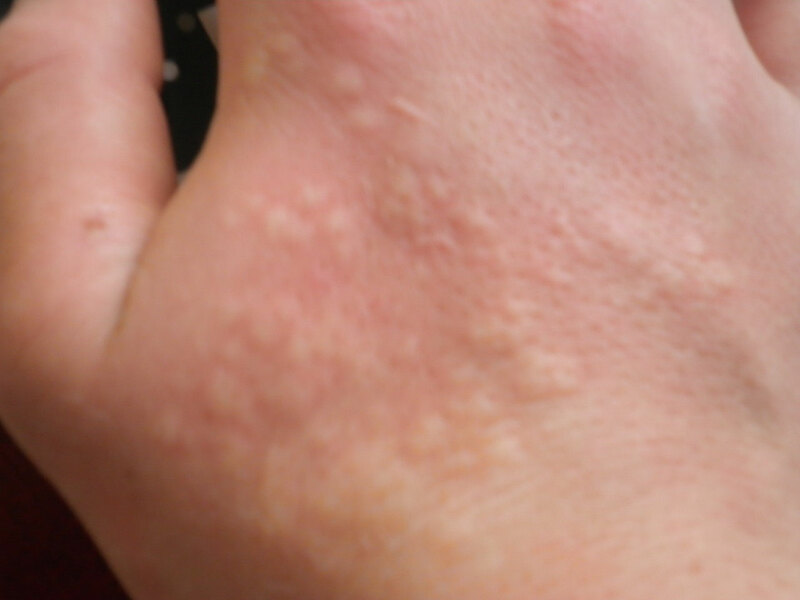 In severe cases the rash develops blisters. Fluid from these blisters does not contain urushiol and therefore does not spread the rash. However, you can get a rash from oil that has stuck to shoes, clothes, backpacks, and gear. Urushiol can remain on gear and clothes for years — in other words it will not break down or dry out and become harmless on its own. You must clean your gear and clothes with soap and water or alcohol. Study photos and plant ID guides like the one above so that you can quickly spot it and avoid it. Hike in long pants and long sleeves. We recommend doing this for other reasons as well, like preventing sunburn. Wash your clothes and gear whenever you are in town. If you brush up against poison ivy or set your backpack down onto it, use your camp towel to wipe your pack down with alcohol (denatured or rubbing). Afterward put the towel in your dirty clothes bag until you can do laundry. If your clothes brush up against poison ivy, take them off and keep them outside the tent. You can either try to field-wash the clothes using Dr. Bronner’s, or simply stash them into a dirty clothes bag and change. If you touch poison ivy, immediately rub the area with Purell or alcohol, or wash the area with water and Dr. Bronner's. If you know you have particularly bad reactions to poison ivy, consider using “Ivy Off,” an over-the-counter skin cream that blocks the urushinol oil. We strongly discourage thru-hikers from bringing dogs because of the risk from alligators. Dogs are also hazardous to you because there is so much poison ivy so often along the Trail. While dogs themselves are usually not sensitive to poison ivy, the oil sticks to their fur and can then spread to your hands, clothes, sleeping bag, tent, et cetera. A rash does not appear until 12 to 72 hours after contact with the oil. If you clean the contact area immediately after contact you can avoid getting a rash. Wash your skin with Dr. Bronner’s and water multiple times. If you don’t have soap, rub the area with alcohol or hand sanitizer (which is alcohol based) and wipe clean. The effectiveness of cleaning decreases with time as the oil absorbs into the skin. Field treatment can be frustrating and difficult. A lack of running water, soap, and towels makes thorough cleaning of your clothes and gear difficult. It is best to get into town, check into a motel and clean everything, including yourself, in the shower. The greatest concentration of poison ivy is along the Suwannee River. Because of this, it's a good idea to buy a bottle of 70-90% rubbing alcohol while in White Springs. If you get exposed to poison ivy after leaving town, wipe the exposed area with alcohol using a camp towel and store the camp towel in your dirty clothes bag. The first opportunity for a hot shower after White Springs is the Holton River Camp. Next are Suwannee River State Park, Dowling Park, and Madison (near I10). At one of these places take a hot shower with soap, do laundry, and wipe down your pack (etc) with alcohol. While poison ivy prefers wetter areas, stinging nettle is found in dry, sandy places like pine flatwoods or anywhere saw palmetto or wiregrass dominates. Northbound thru-hikers first see it north of the Kissimmee River area. There are many varieties of stinging nettle worldwide. The kind in Florida typically grows very low to the ground, less than six inches tall. It is immediately recognizable by the numerous white hairs that cover its stems and leaves, as well as small white flowers atop the center stem. It does not die off in winter and remains green when surrounding grasses have all turned brown. We've never found it in swamps or seasonal wetlands and it seems to prefer drier, sandy soils, the kinds of places where pines, saw palmettos, and wiregrass thrive. Often it is hiding within the wiregrass, a dark green sprig among the golden grasses. 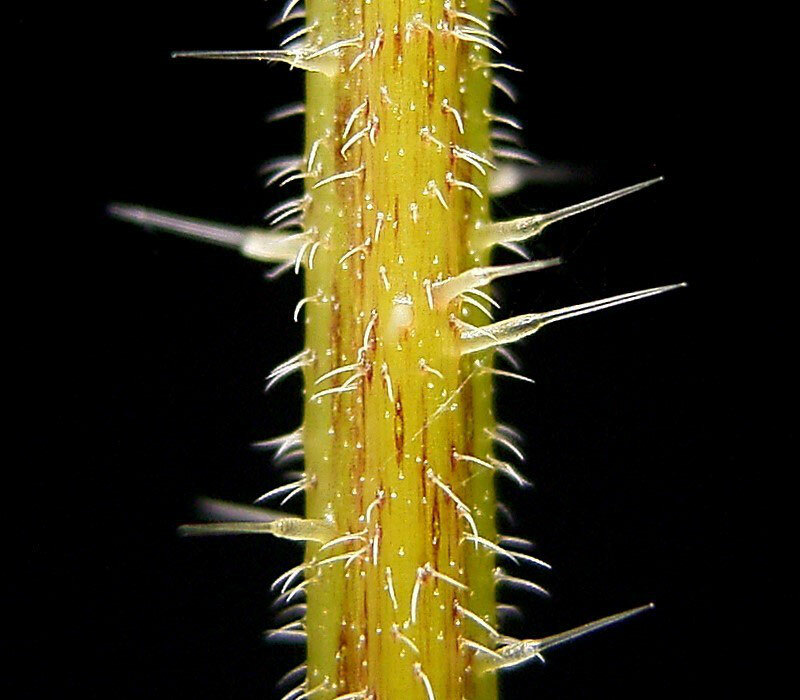 When you brush against the plant's hairs, the tips break off and the hairs becomes thin tubes, like needles, filled with poisons like acetylcholine, histamine, 5-HT (serotonin), moroidin, leukotrienes, and possibly formic acid. These compounds create a painful sting, like an insect's sting, and raised itchy bumps like hives. Since stinging nettles do not contain urushinol oil, the irritant in poison ivy, the rash they create is different than a poison ivy rash and far less intense. The hives can go away as quickly as a few hours. Since nettles do not contain urushinol oil, applying Purell or straight alcohol to a contact area has no positive effect. Instead, you need to remove any nettles — the tiny hairs you can't necessarily see — from your skin. To do this, apply a piece of sticky tape like duct tape to the affected area and then peel it off. Do this a few times and the tape should grab the nettles. Afterward wash the area with soap and water. If that isn't an option, just rinse with water. There is no need to go into town immediately and wash all your gear, since stinging nettles do not contain urushinol oil and there is no risk of contamination of your gear. You would never set up camp next to poison ivy, but since nettles are often hiding in the wiregrass and other groundcover, they can be easy to overlook. We recommend keeping your socks on why walking around camp in sandals or if you get out of the tent at night to pee. Poison sumac contains the same urushiol oil as poison ivy but its effects are far greater. It grows as woody shrubs or small trees 5–30 feet tall. Fortunately for Florida Trail hikers, poison sumac only grows in north Florida, exclusively in very wet soils or permanently inundated lands like swamps, and we have not spotted any poison sumac in the Bradwell Bay Wilderness or the occasional wetland in Apalachicola NF and Eglin AFB. If poison sumac is confirmed on the Florida Trail we will post a more extensive description along with pictures.